A visit to the Pacuare Lodge is a journey to a magical place where the beauty and diversity of tropical nature delight the senses, authentic Costa Rican hospitality makes you feel like part of the family and the outdoor adventures range from exhilarating to sublime. The lodge’s comfortable bungalows and elegant suites are nestled between a pristine wilderness reserve and the Pacuare River - Costa Rica’s most spectacular white water route. 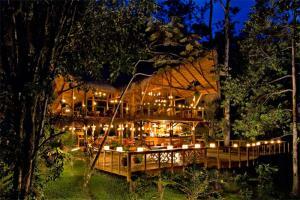 Located on the banks of the Pacuare River. Guests arrive and depart as part of a multi-day rafting tour.